It’s true, being a mom can be rewarding, but it’s also hard work with zero vacation days. Taking a weekend off is tough, but what if you could escape for just the day, and emerge by evening feeling as relaxed and refreshed as you would from a longer trip? We’re here to tell you that you can, thanks to eight New Jersey day spas that offer more than just your average massage table. These luxe locations — some with pools, gyms, special treatment rooms and cafes — make a few hours feel like an incredible getaway. So go ahead and book that sitter; it’s time to take yourself away to one of these 9 relaxing NJ spas for a little daycation. There are no words to describe how well Island Spa and Sauna both welcomes and relaxes you from the moment you step inside. Island Spa and Sauna is a 30,000 square foot day spa that aims to revitalize and rejuvenate your mind, body, and soul. The spa is fully equipped with foot and body massages, Korean body scrubs, and facials, as well as unique dry saunas made from clay, rock salt, and charcoal. You can enjoy delicious Korean cuisine or make a stop at the juice bar. We know you’ll love the sauna, “Treasure Island,” which is engraved with semi-precious stones and crystals known for their healing power. That peaceful feeling washes over you as soon as you enter the former church location. Stained glass windows bring a beautiful light into the space, as you head upstairs to tranquil surroundings with the sounds of a soothing waterfall. Choose to spend the day winding down with indulgent treatments like the 24K Gold Facial and Hydrating Body Polish, then head to the salon downstairs where you can get a blowout and makeup, perfect if you’re planning to extend your vacay day into the night. 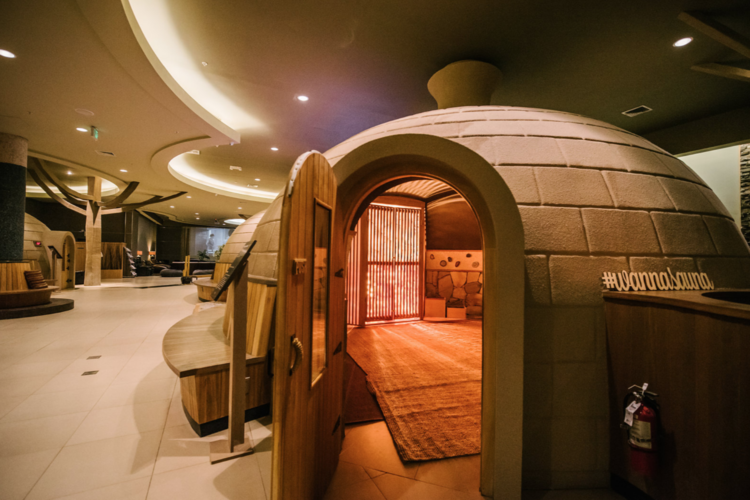 This contemporary Korean style bathhouse is like taking a trip to a fancy destination spa. It’s open 9am to 12am, and for a single fee ($65) you can spend as long as you like soaking up the zen vibes. 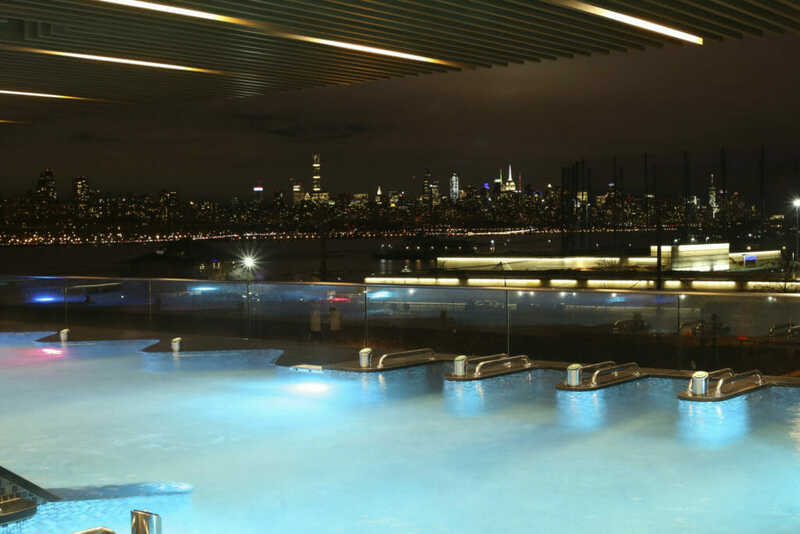 Relax on the rooftop garden with spectacular views of NYC, lounge around at the infiniti pool, walk the shallow water foot massage path or indulge in the outdoor baths, like the silk one, that infuses hot spring microbubbles directly into the water to nourish and improve skin elasticity. Oh, and don’t forget the treatments (available in the appointment only spa) like the salt and oil scrub, enzyme facial and Balinese massage. With two locations in Bergen County, The Fountain Spa has state-of-the-art facilities and top-notch treatments in sophisticated surroundings. Book one of their day long packages to be truly pampered, like the Special Day for Moms, which includes a whirlpool bath, seaweed wrap, Swedish massage and pedicure, as well as a spa cuisine lunch. The Hackensack location is in the The Shops at Riverside, which makes it convenient to add in some retail therapy, too. When you book a massage at this spa, you gain access to the indoor and outdoor pools and fitness facilities. Start your day with a sweat sesh on the elliptical machine, order lunch poolside, then swim a few laps or just unwind in the jacuzzi. When it’s time for your appointment, you’ll head to the beautifully appointed waiting room, with its cushy chairs and cozy throws, which are so inviting that you might never want to leave. Take an escape to the far east when you enter this soothing spa and salon. While there are many medi-spa treatments like intense pulsed light facials and teeth whitening to choose from, the unique body treatments are the epitome of relaxation and day-cationing. The most indulgent? The Razul Experience, which takes place in a beautifully tiled room with a relaxing dome-shaped starry sky, complete with a mud bath, vichy shower and flotation ritual. Located in the Grand Cascade Lodge, this lavish spa is the ultimate in indulgence. While it’s sister spa, Elements (also located on the Crystal Springs property), has beautiful amenities and surroundings as well, this one focuses on extravagance luxury, offering complimentary pink champagne and chocolates. The glamorous decor — complete with waterfalls and a quartz crystal encrusted ceiling — sets the tone for opulent treatments like the Decadent Cinnamon Brown Sugar Scrub, or the two-therapist, Four Hand Massage. Enjoy a post-treatment foot soak with every service (um, sign us up right now, please!). When you enter this spa with floor to ceiling windows overlooking the beach and ocean, you might just forget that you took a car here and not a plane. The newly renovated spa, decorated with soft, calming beige tones and natural stone, is the perfect place to relax and reboot for a few hours. Try the popular Fire & Ice facial, or go for one of the massage therapies, like the Warm Bamboo, which uses heated bamboo rods to melt away stress. Take a break in the 15,000 square foot spa that has fitness facilities, whirlpool, sauna, steam rooms, and an indoor pool. Set among a wooded retreat (there are also walking and biking trails should you want to get outdoors), you’ll feel relaxed as you settle in to the secluded oasis. The serene treatments include a heated stone massage, a resurfacing facial and a tension-relieving spa pedicure.